Nudgee Cemetery has a range of accessories available for burial facilities. These range from granite vases and granite bases suitable for lawn graves to bronze vases, solar lights and statues. Please view our latest price guide at the end of this page and contact us if you wish to place an order. The range of granites available have been extended to include Australina Calca Red, Australian Imperial Black, Blue Pearl and Emerald Pearl. There are many other bronze accessories and statues available. For more information please contact the Cemetery Office. Our Bronze Vases, Lamps and Statues come from Italy. An order will be placed upon receiving payment. Orders usually take around four weeks to be delivered. 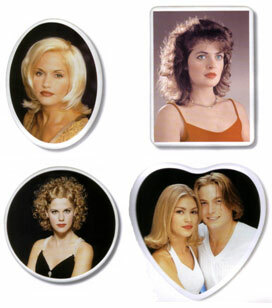 Ceramic photos are also available and can be arranged at the Cemetery Office. 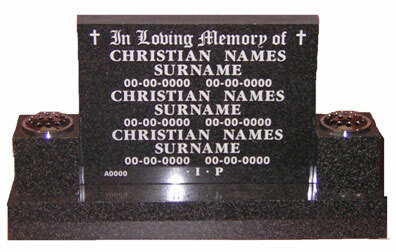 When selecting the size of the ceramic please ensure that there is sufficient space on the headstone. A gold rim is available at no extra cost or if preferred a frame can be purchased. Photos should be scanned at a minimum of 300 dpi and emailed tocemetery@bne.catholic.net.au or the Cemetery office staff can scan the photo for you. Our ceramic photos come from Italy. An order will be placed upon receiving payment. Orders usually take around four weeks to be delivered. The Cemetery Office has a range of Ceramic Crosses, Wreaths and Roses. Please contact the Cemetery for prices and availabilty.